On St. Patrick’s Day, no less, the docket for USA v O’Dwyer shows the USA has filed an Unopposed Motion to Withdraw Request for Pretrial Psychiatric and Psychological Examination of Ashton O’Dwyer. This disturbing pattern of action by O’Dwyer merits an evaluation to determine if he is competent to stand trial and is also further competent to represent himself throughout these proceedings. 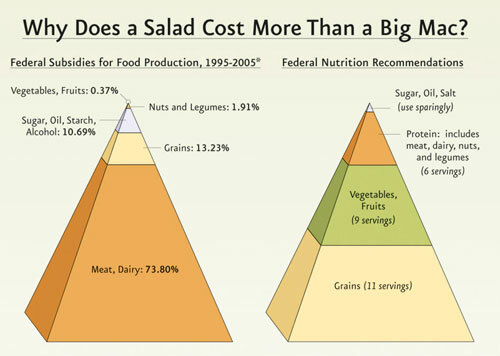 According to the Physicians Committee for Responsible Medicine, meat and dairy production get 74 percent of federal food subsidies. Fruits and vegetables? Try 0.37 percent. As Mississippi native Jim Henson wrote, it really “is not easy being green”! Chip Merlin has done such an excellent job summarizing the key points of How Insurers Made Millions on the Side that I’ve reproduced the post on his Property Insurance Coverage Law Blog in total with this h/t and big “thank you”. The Sarasota Herald-Tribune conducted a year long investigation into the manner Florida insurance companies diverted premiums and monies as expenses and losses to hide actual profits. This revelation is probably shocking to many who have been told repeatedly that the Florida insurance industry is losing money as a result of “unfair” rates and for other claims related reasons. Investors and executives in 2008 moved $1.9 billion in policyholder money out of heavily regulated insurers, where profits are capped and dividends are restricted, to separate companies that are owned by the same people, housed at the same address and sometimes use the same employees. Meanwhile, insurance executives complained about losses and state-mandated discounts, and pressured state regulators for permission to charge homeowners more — even to end rate regulation altogether. I wonder what the response is going to be from those who supported unregulated insurance rate laws. It is human nature to have a hard time admitting mistakes. If anything, this story demonstrates that laws need to be changed to allow much greater oversight by regulators because some insurance executives cannot be trusted to be honest stewards of monies set aside for the payment of claims.